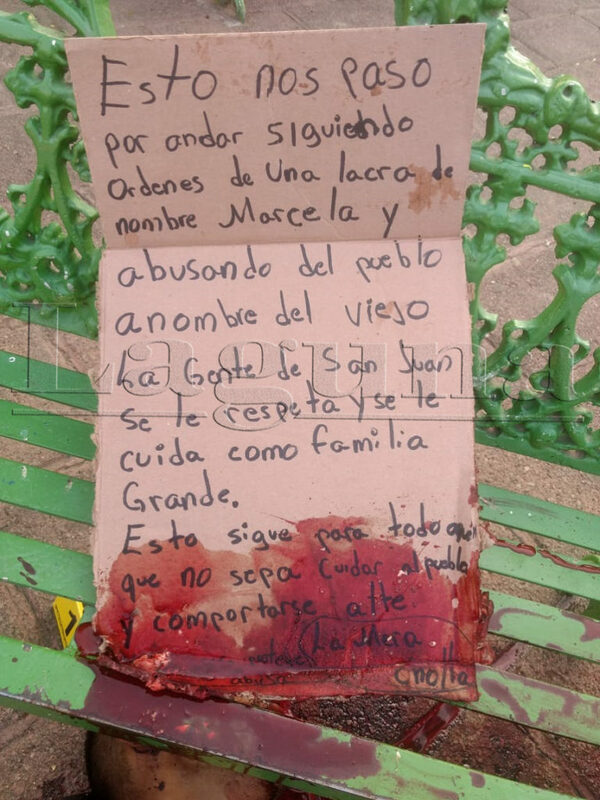 The natives are restless, one body dumped in San Juan Cosala plaza with message written on a cardboard panel, 2 others found in municipality of Joco yesterday. I'm having a hard time translating that properly. What does it say? Well it could be indicating "vigilante justice" against La Cacica or some other retribution from underlings or a rival narco group. She certainly wasn't very popular in many quarters since she assumed "power". Here's a Google translation of a Spanish transcription in the Weekly Laguna: "This happened to us by following orders of a scourge named Marcela and abusing the town in the name of the old man. The people of San Juan are respected and cared for as a Grande family. This continues for anyone who does not know how to take care of the people and behave "(sic). or narco telling the kids to follow the rules. I have been told by someone that the big boss in Ajijic has told the sellers not to bother or rob the foreigners and not to sell drugs to young kids or they would be killed.. so who knows it may be the same over there.. In an event apparently connected to this and also occurring on May 15, a woman named Marcela, 30, and her boyfriend Efraín, also 30 years old, were murdered in a Yukon pickup at 40 Luis Gómez Street, at the intersection of Eighteenth of March Street, in Zapotitán de Hidalgo, a precinct of Jocotepec. A young man was also found at the scene with a gunshot wound. He was transported in serious condition to a clinic for treatment. State authorities were alerted to the two bodies and the injured person by means of a phone call informing them that a family had been kidnapped. When the state police arrived at the site three pickups and a Mustang were found. The woman named Marcela was found in the back of the Yukon pickup and her boyfriend behind the steering wheel. Initial investigations revealed that the woman and the men were fleeing because they had received death threats. Authorities who were consulted and who preferred to remain anonymous indicated that the woman was apparently the head of an extortion gang that was the scourge of San Juan Cosalá merchants. The murdered man and the youth were members of that group. As I said earlier, she was considered a PARIAH (in caps) by many. The perp suspect list could probably fill a small telephone directory and could be from many different angles. The wild west is not dead.. This is the real Mexican justice system. You reap what you sow. My neighbor is Mexican, lived in Ajijic his whole life. He told me that when there is crime in the neighborhood, people would find out who it was, hire a real bad guy(s), who will take the peep(s) out, hurt him/her very badly, and the crime stops. Depends on the neighborhood, not universal by any means, and nothing you can count on. We and friends experienced "neighborhood" justice in different areas when living in Mazatlan...usually very effective. It's the only justice there is in this country. That's why some towns are cartel/crooked politicians controlled and some are autodefensas controlled.